Any mention of digital watches and the first thing that comes to mind is Casio. The company is a powerhouse when it comes to digital timepieces and for good reason, it has led the way in developing various new technologies and features to digital watches without compromising style and looks. I’m a watch collector and one of the pieces I love to collect is the Casio G-Shock watch. It’s relatively affordable, it turns heads because of its size and, as I’ve mentioned, it’s packed with features. If you’re a watch collector AND a gadget lover then you will love the new Casio G-Shock GB-6900. The Casio G-Shock GB-6900 is a new digital watch with Bluetooth connectivity. It’s a cool feature for any watch to have Bluetooth and it does support the comment that putting Bluetooth into anything will make it cooler. You might wonder how Bluetooth is used in a watch. Well, for starters it can linked to your computer, laptop or portable device so that it can sync with email. It will also be easier to sync wirelessly with internet time providers. But the possibilities for a Bluetooth enabled watch are endless. Currently, Casio is talking to various developers to encourage them to develop apps that will work with their watch. Apps related to health, fitness, sports, even home entertainment. Let’s see what developers will think of to match with this G-Shock watch. The GB-6900 will feature Bluetooth 4.0, which is cool of them as it’s already future-proofed. Casio said that the watch battery can last up to two years even with Bluetooth on and used for about 12 hours a day. The long battery life is due to the use of Casio’s Touch Solar technology that charges the watch when it is exposed to the sun or strong artificial light. 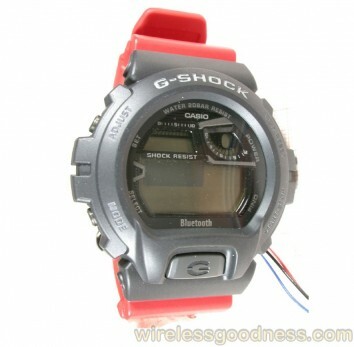 There is no pricing available yet for the Casio G-Shock GB-6900.